Ron Ellingson, president of Mt. Baldy Ski Lifts Inc., holds one of the hollow plastic conservation balls produced by Glendora-based manufacturer XavierC LLC. Ron Ellingson will be watching the Mt. Baldy reservoir closely this ski season. The 10-million-gallon reservoir is used to make snow during the ski season and like any body of water, succumbs to evaporation, but for Ellingson, president of Mt. Baldy Ski Lifts Inc., the evaporation means higher costs and less snow for skiers. So, to keep costs down and provide more snow to visitors, Ellingson contracted with Glendora-based manufacturer XavierC LLC, to install hollow plastic conservation balls to reduce the evaporation. The company started delivering the balls in November, but due to the change in season, the rest will be delivered in the spring. The balls are 4 inches in diameter and float along the top of the reservoir to reduce evaporation by up to 90 percent. As the water level rises and lowers, the balls adjust by piling on top of each other or by spreading out across the surface. Water is pumped to the large reservoir from a smaller million-gallon reservoir that is filled from natural underground wells. 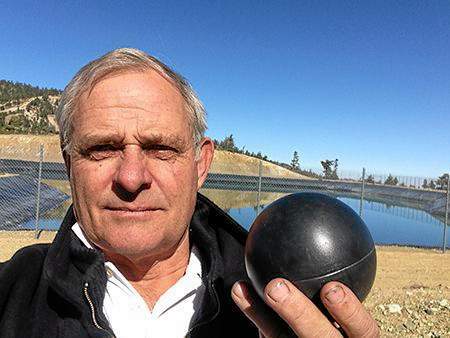 The use of the balls could save Ellingson about $10,000 a month in pumping costs and boost the production of the man-made snow they depend on for their ski runs. “If we don’t have a full reservoir at the beginning of the year, we can’t cover all the runs and makes it so the skiing isn’t as good as it would be if we have them all covered,” Ellingson said. The owner of XavierC LLC, Sydney Chase, approached Ellingson at the Mt. Baldy Lodge, which he owns, about the product. Chase has been visiting Mt. Baldy for 10 years and saw the need for her product. The company has contracted with the Los Angeles Department of Water and Power to install $7 million to $8 million balls on its reservoirs. “We’ve been approached by municipalities, water districts, we’ve been approached by several different ski resorts waiting and watching to see how Ron’s goes,” Chase said. RUNNING SPRINGS >> Morning sun glinted on the snowy ski runs as the thermometer flirted with the high 20s on opening day of Snow Valley’s winter season. And the newly covered slopes of local mountains translated to green – as in money – for those resorts. Advanced skiers John Reilly and his fiancee, Lesandre Barley, both of Running Springs, celebrated their first day on the slopes Tuesday. “They did get 6 inches of snow and groomed it, so it’s a superb day up here,” said Reilly, 45. Barley, 31, reported that two runs were open, including The Edge, which is the terrain park. Temperatures marked the coldest opening the resort had seen in a long time, said Nick Chatterton, 34, Snow Valley’s snow surfaces manager. Chris Toth, marketing director, agreed. A slightly cooler than normal December has propelled snowmaking ahead of last year, which was slightly warmer than normal for the 12th month of the year, said Steve Travis, a meteorologist for AccuWeather. “It’s been a decent season so far,” said David Stone Junior, a San Bernardino Mountain entrepreneur, who owns Fireside Lodge and Bear Creek Resort, both in Big Bear Lake. Travis said that there will be a gradual warm-up at the end of the week and temperatures should rise to slightly above normal for Sunday and Monday. During the peak of the warm-up, some of that man-made snow might be melting, he said. The next chance for natural snowfall in the Southern California mountains will be at the end of next week – but it’s not a sure bet at this point. “We have a rudimentary sense of what is happening,” and that it might bring cold Canadian air back into the Southland, he said. Snow-making at Mountain High is going so well that night skiing is expected to begin Friday, the resort reported Tuesday on its website. Robbie Ellingson, general manager of Mt. Baldy Ski Resort, said that he is hopeful that the beginners’ slope will open this weekend, although the resort has been open for “snow play” since Thanksgiving. Like other ski slope operators, Ellingson said he is hoping for natural snow. “Typically, when the mountains are white, we do better,” he said.